Starting at the Intrepid Potash, LLC settling ponds in Shafer Basin, the road takes a meandering course, upslope past hoodoos, towers and buttes. As we drove the track, it roughly paralleled the flow of the Colorado River. As we climbed, the river descended until there was a 2000-foot difference in elevation between the river and our location atop the sandstone canyon rim. Along this section, are the best views of the Colorado River Gorge. Prior to reaching the highpoint above the gorge, we came upon a large, shallow pothole. Dependent for their existence on rainfall and local runoff, wet and dry potholes dot the Canyonlands landscape. After a summer shower, they shine like so many silver coins in the sunlight. Each pool of retained water has its own unique life-cycle. Some support ancient aquatic life forms, while others are drinking water sources for wild horses or other mammals. In any given pool, a wide variety of insects and other organisms might sustain themselves through their entire life-cycle. Although our selected pothole was within yards of the main track, no wheel marks had disturbed or desecrated its pristine beauty. The stretch of road we just described starts as Potash, by the Colorado River and ends on the mesa top in Canyonlands. On many maps, including our 2005 Edition of the Delorme Utah Atlas & Gazetteer it appears as “South Fork Road”. Recently, Google Maps began showing both "South Fork Road" and the more common, "Shafer Trail" along this section of road. According to our research, “South Fork Road” is a social-road name, not used by any official agency in the area. When we questioned several Moab local residents, each said that the road has always been the “Shafer Trail”. On most locally produced maps, there is no other name associated with the road, the road. The track has its origin in Shafer Basin, adjacent to the potash settling ponds. Just below its mesa-top crest, stands Shafer Campground. Before extensive grading allowed its use as a haul-road for uranium ore in the late 1940s, a local rancher named Shafer used the trail each year to herd cattle from what we now call Shafer Basin to the mesa top and back again. 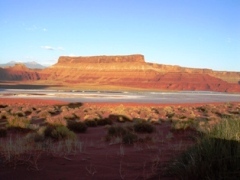 In the interest of public safety and standardization among mapmakers, the road from the Cane Creek Potash Plant, up to Canyonlands National Park, should bear the name of its originators, John Lloyd "Sog" Shafer and his brother Frank Shafer. Since the track is as much a trail as it is a road, henceforth its name should be, “The Shafer Trail”.